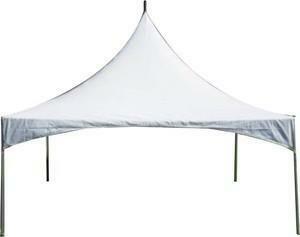 Our 20' x 20' high peak frame tents will make your event look classy. The tent seats up 48 people. Our pricing includes set-up on the day of your rental (or the previous day, depending on our delivery schedule) and pick-up on the day following your party (or the evening of your party--after the party is over). No additional charge for an overnight rental. Don't forget to rent tables and chairs from us too! Please note that we do not set up tents on asphalt or concrete as we use stakes to secure tents to the ground.